I love October. It has always been my favorite month. The weather is finally starting to get cool, my anniversary happens (that's in here just as a reminder for Mike), the kids are on break and Halloween is by far my favorite holiday. Before I had Ella, I had no idea October was also Down syndrome Awareness Month. Most people know that October is Breast Cancer Awareness Month. If I was in charge of picking the month for Down syndrome Awareness, even though I love October, I am not sure I would want to go up against the pink ribbons. I might have picked January, I mean, other than my birthday nothing happens in January, or what about poor April, sometimes even Easter skips it over, I am sure it would love a little Down syndrome Awareness. March makes sense too because it is the 3rd month, but hey, we are stuck with October so we have to make the best of it. For October, I am going to do one thing each day to raise awareness of Down syndrome. I am going to blog, I am going to stop the person at the grocery store who gives Ella a weird glance and explain to them why she is so adorable. I am going to raise 5000.00 more dollars for her walk, I am going to be out there in my community letting everyone know Down syndrome is not weird, or bad or something that makes a life not worth living. I know my friends who have kids with Down syndrome are going to do the same. We are a small but powerful army marching against a nation that values some unrealistic idea of perfection over loving what you are given. We are up against a lot in October - Cooler weather, Breast Cancer Awareness, Halloween, my Anniversary (sorry, just wanted one more reminder for Mike) but if we all speak up we can be heard. We all need to tell our stories - show the world that our kids are "more alike than different" and that we are a force to be reckoned with. 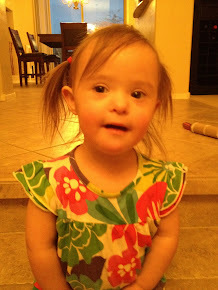 Today - for day one of Down syndrome Awareness Month - I am going to be in Payson, AZ - without my adorable Ella. Every minute I spend without her I realize I never want to be away from her. When she was born I remember thinking I would never want to take her anywhere and now when I am forced to be away from her, there is this giant hole in my heart that misses my little Ella Bella like crazy. That little girl makes every single minute of my life better. So, while I might be starting my awareness journey away from her, it only makes me more aware of how my life is better with her around. I will close with my shameless plug to visit the link at the top of the blog that says Ella's Entourage and donate to her Step up for Down syndrome Team. I set a goal of 10K for her team, we are almost 1/2 way there and have 26 days to make it the rest of the way. I set a big goal because she is worth it. Every kid with Down syndrome is worth it. This money goes to so many amazing things to help support families, kids and provide more awareness in the community. Please donate if you can. Tomorrow is an update on Ella. She is going to be 20 months in October and I can't believe how big she is now! Hawaii has charts - Did you know that?